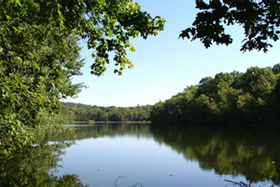 Located just to the east of the city of Middletown is Highland Lakes State Park. Consisting of more than 3,000 acres of undeveloped woods and lakes in Orange County, this is the largest undeveloped park managed by the Palisades Interstate Park Commission, and it’s a popular place for those who love the outdoors. Goshen and Monroe residents are often pleasantly surprised by Highland Lakes State Park. Featuring a series of slowly rising parallel ridges with lakes and wetlands in between, it provides a variety of terrain and scenic vistas. The ruins of old buildings left over from the deserted Camp Orange, once a summer recreation area, have been removed, though the foundations remain visible, so the area is surprisingly authentic for one so close to civilization. Highland Lakes State Park is largely undeveloped, but that simply adds to its charm for most of the people who like to visit. This isn’t the sort of place where you’re likely to find crowds of walkers on any given weekend. In fact, no trails are officially maintained at present. Of course, that doesn’t mean the area isn’t a real favorite among local hikers. There might not be set routes for you to follow and there are no trail maps to act as a guide, but plenty of unmarked trails are available and there isn’t any dangerous wildlife that you would have to contend with. Fishing: As the name suggests, there are plenty of lakes within the park, and fishing enthusiasts enjoy seeing what they can take out of the water. Horseback Riding: One of the reasons why hikers are able to pick their way across paths is that plenty of horses have come before them along the park’s series of informal trails and woodland roads. Model Plane Flying: The area might offer plenty of dense forest, but there are also a number of wide-open areas that have become popular with local model plane enthusiasts. Mountain Biking: Though not exactly mountainous, Highland Lakes State Park is a great place to head on two wheels. The rocky, root-strewn nature of most trails makes for an engaging ride, and there are plenty of switchbacks when you want to go fast. With its untamed beauty and diversity of flora and fauna, Highland Lakes State Park is a fantastic place to visit and explore when the sun is out or the fish are biting. Best of all, it’s situated within easy striking distance of Middletown. It’s just one of many great things to do in Middletown.